Yeah, we know that we’re getting mad Nike and New Balance-centric right now. We wanted to talk up the adidas Originals 84-Lab pieces today, but we weren’t sure if there was some retailer embargo on talking them up, so we didn’t. When in doubt, we talk up New Balances, because we’re hipster douches who are riding the Made in the U.S.A. wave right now. We think the NB M1300 is beyond criticism — it’s the ideal running silhouette and it looks good with anything. We mess with the Jordan 28 (don’t knock it until you’ve tried it on) and all, but you can’t throw that shoe on with everything — it requires some effort. You couldn’t just chuck it on with tracksuit bottoms, some jeans or with some quasi-formality #menswear style (word to Wes Anderson), but you can with the M1300. In fact, if you put these on and don’t see a satisfactory toe down view, we feel sorry for your mother. And here’s the other great thing about the M1300 – it was insanely expensive way before shoes got insanely expensive. Crying about the 200 pound RRP on a Barkley Posite? That was chump change compared to the $130+ pricepoint of the 1300 in late 1984 – in today’s money, that’s like, 100k or something. That meant only drug dealers or monied runners could floss in this design (NYC, Boston, Baltimore and Amsterdam seem to be key regions for this shoe) and the ads of the time made no secret of the fact only sultans had the expendable cash for these — “Mortgage the house” was the line used in advertising and nobody had seen anything like the encapsulated wedge of EVA in polyurethane that made the Encap midsole compression proof. Now, we take that for granted as a quaint, unobtrusive piece of 80s tech on retro releases for a lifestyle market, but in its day it was a game changer. The unique last with the higher toe box and the lightweight feel, heel stability device, Achilles “dip”, newly engineered footbed and premium nubuck upper made these extra aspirational, but crucially, for all the breakthroughs, they’re a beautiful design. It took a long time for this top-of-the-line design to be superseded and we still think, alongside the insanely pricey adidas Forum, things never got much better than this era of money’s-no-object classics. But yesterday’s mugger-bait are today’s basics. 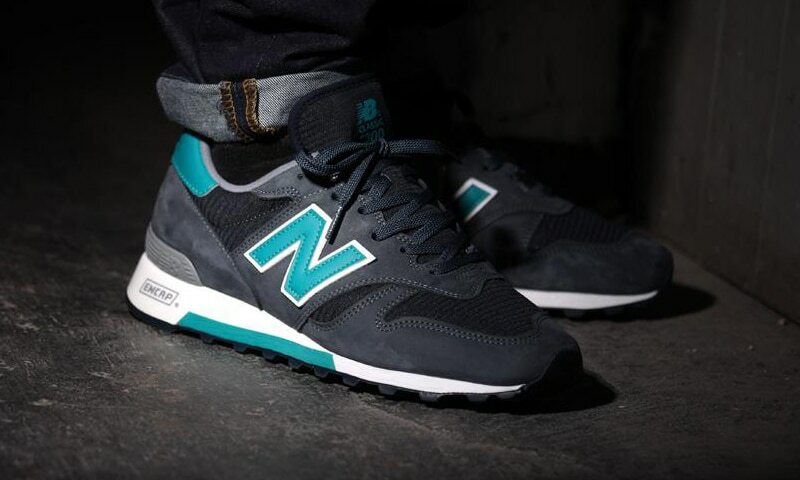 The New Balance M1300ER and 1300NB are perfect colours for this shoe and while we try to profile people based on their shoes, if you wear a pair of these, we can safely assume you know what you’re talking about, you’re a drug dealer locked up since 1985 who just got released from jail, or a serious runner who woke up from a 27 year coma. Saucony & Bodega’s Elite squad is back.